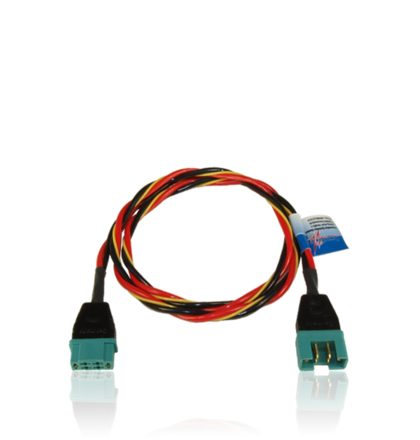 PowerBus™ cable is manufactured specially for PowerBox Systems. The PowerBus™ cable is extremely flexible, and is made up using very thin individual strands in order to pass the maximum current through the given cross-sectional area of 1.5 mm². The in-sulation is made of a special material which is also employed in full-size aviation. It is virtually indestructible, and offers excellent protection even when reduced to just a thin film around the copper conductor. This insulation produces a weight reduction of about 30% compared with the much cheaper PVC. The insulation is fire resistant, and its heat resistance is much higher than the usual PVC. To save more weight, the conductors are of different thickness: power is carried by two thick wires (1.5 mm²), while a thin wire of 0.25 mm² is used for the signal. This produces a further weight saving of 27%.